Denver isn't exactly a hotbed of classic delicatessens serving up deliciously fatty pastrami and corned beef. But for just one day this week, the best of New York will infiltrate the Mile High City with exactly that. 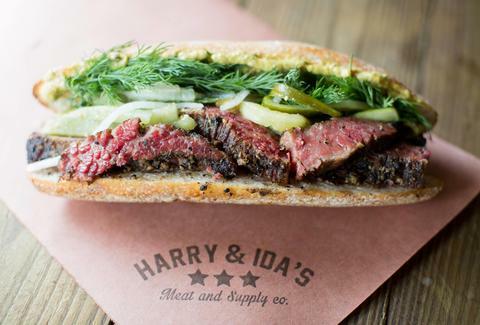 This Wednesday, beloved NYC delicatessen Harry & Ida's, which opened to rave reviews last spring, will set up shop in RiNo Yacht Club inside The Source. Beginning at 11:30am, and until supplies last, executive chef and owner Will Horowitz (also of NYC's famed Ducks Eatery) will offer his Pop’s Pastrami sandwich -- a beast of a sandwich filled with warm, thick-cut pastrami, dill, cucumber, and anchovy mustard. If there's anything that could make Denver feel like New York for a day (but without its horrible summer humidity), it's this. Find out more about pop-ups at The Source here. Lucy Meilus is Thrillist's New York Editor and also goes by the name "Pastrami Princess." Follow her on Twitter and Instagram.